Your work is very balanced between illustration and design. What brought you to this kind of work? I came to illustration differently than a lot of others because I was a designer and art director first. Over time I started to introduce illustration into my own projects. This helped me see things from both sides—as the one creating the designs, and the one selling them. I don’t know from experience what it’s like for an illustrator starting out but I’ve spoke to a few about how much labor they have to do just to earn the same as a junior designer would. I kind of cheated in that way. I’ve always been able to come at everything from a design perspective first and then slowly build in the illustration work. Are there any lessons you’ve learned as a designer that you think would be valuable for illustrators? Learn to be your own art director. As an art director you learn to identify what needs to be communicated, what parts of an illustration might throw someone off and what the whole process of presenting to stakeholders is actually like. As an illustrator, if you’re thinking about these things and the whole approval process, you’re going to have much more control over the final product. With my clients where I act as the art director, I don’t even need to do a lot of sketches. I can walk into the room, sell the idea and then execute it. Otherwise, there are ways I can help the art director with without even being in the pitch room with them. I can make their job easier by providing them with points on exactly how to sell the illustration. Of course, without the experience of being in that room, it’s going to be really hard to pull that off. How can we become better art directors? The best way is to get a job as one. Outside of that, learn from one. If you’re an illustrator, try and get an inside job or internship at an agency as practical life experience. Finding some way to get the opportunity of working alongside an art director where you both are on the same team would be very helpful. You might even get a chance to work with other illustrators you like and discover what it’s like to be the person who finds the right illustrator to pair with a project’s direction. How does being an art director play out with your clients? A lot of my work is with craft breweries. This means knowing all the ins and outs of beer, printing and dealing with the TTB. My clients aren’t just getting an illustrator but someone who can guide them through the process of printing so that they don’t have to worry about it. Even though press checks aren’t the most fun thing for me to do, they are part of the value I bring to the table. My clients can take comfort in knowing that what I send them on screen is going to be what they get. Sometimes these smaller breweries have never been to a press check before. If they come with me they might see me pushing back with the printer and fighting for their stuff. This really shows the value that I bring. They start to see me as someone who is on their side—not as an outside contractor, but as a partner in their business. 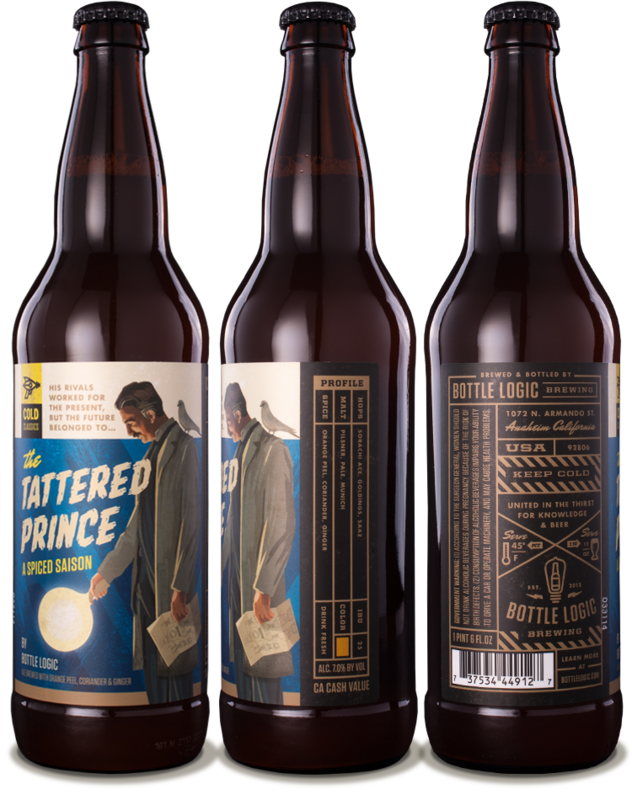 Branding and label design for Copper Kettle Brewing Co.
You seem close to your clients. How do you cultivate these relationships? Most of my clients found me because I had work in my portfolio similar to what they were looking for—so I didn’t have to sell them too hard on working with me. That’s important. But even when you get clients that are pumped to work with you, you can’t take them for granted. You still have to deliver value beyond what they expected. You want them saying “Yes, I loved your work, but I didn’t know you were an awesome person and that you can geek out about the things I like.” If my client is inspired by something I really want to dig into it myself and see if I can find a way to share their passion. When that happens, I can start bringing things to the table for their project that they weren’t even thinking of. The majority of the businesses I work with are family run or family like. I like it when the business is still small enough that the owner has the opportunity to engage in the project the whole way through rather than walk in at the last minute and say they don’t like it. I’ve been able to find a sweet spot where a company is big enough to understand the value I can bring and pay a fair price but not so big that I just feel like another cog in the wheel. A good example is Keymaster Games. Because I really championed their stuff, they wanted me to work on more. It wasn’t like “Here’s the yard, I’m done”. I really wanted to promote the game and see it become successful. That’s the best—seeing the client succeed. Sure, you can create artwork that people like, but the real thing is when those who it is actually intended for love it—not just other designers and illustrators. What is your opinion on having a unique style? I don’t have a set style; I illustrate what I feel is best for the project. I like being able to combine all of the elements of design and illustration so that it’s cohesive, but the style I use to do so changes. While I’m more of a generalist when it comes to style, I’m a specialist in the sense that I’ve chosen to focus my work on these small, artisan businesses. If you like having a single style, I think that’s great. I just get bored. It also helps with my business as I work with multiple craft beer companies and it’s important that they all look different. Other artists may not be able to point my work out as clearly as others but I’ve never suffered from not having work because of it. One of the things that happens when you’re a generalist with style is that you’re able to deliver solutions for your clients that are designed specifically for them because of things like packaging and branding restraints. And your clients will love you because they will get something that looks like no one else—a new style. Sure, if it’s good other people might come along and do something similar but you’ve given your client a leg up on looking unique. There are times when I wish I had a style to hang my hat on so that people can identify the work I do as my own. I’m sure people have seen my work and said“Oh, I like that” but don’t associate it with me. The selfish side of me wants my portfolio to look cohesive but at the end of the day I feel good because I know what I’m doing serves my client best. I think this is what has led to a steady stream of work, clients that treat me well and projects that I want to do my best work for. A worthwhile trade-off in my opinion. What would you recommend to designers looking to add more illustration to their work? If you can draw the human body well, you can draw anything. To me it’s the hardest thing to draw because we are looking at each other all the time so we can instantly tell when something doesn’t look quite right. I feel the most confident as an artist when I’m regularly doing figure drawing—it makes me feel like I can just sit down anytime and draw anything. But when I haven’t been doing it, I get blocked and have trouble getting down what’s in my head. To illustration there is a muscle memory you need to learn that doesn’t really exist in design because everything is so tightly controlled. Once you’ve mastered design it can be really difficult to make that transition. I believe that doing figure drawing breaks that down. You can follow Josh's work on Dribbble, Instagram and the Emrich Office website.